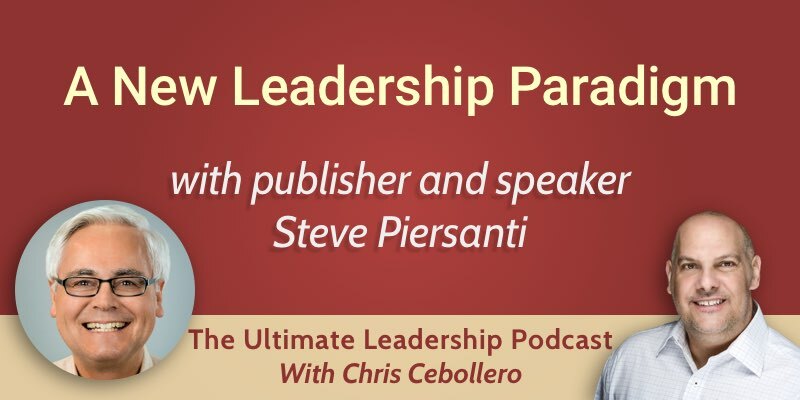 On this episode of The Ultimate Leadership Podcast, publisher and speaker Steve Piersanti shares his new leadership paradigm, an essential and timely change in today’s leadership environment. Servant leadership is an important factor in today’s leadership environment. Management expert Ken Blanchard emphasized that: “The world is in desperate need of a different leadership role model. People have been conditioned to think of leadership only in terms of power and control”. We need to have leaders who lead by serving their people, rather than through power and control. Rather than perceiving the organization as a pyramid, you should perceive it as a network. People at every level of the organization should be making decisions, not just people at the top. In their monthly staff meetings, any staff member can add an agenda or propose an initiative to change something. This keeps everyone engaged. If you want to move your organization into a more servant leadership model, you should change your systems and structures. You have to move from class systems to egalitarian structures. Decision-making is important. If decisions are made by the people at the top and the staff doesn’t know how to push an initiative, then it’s a hierarchical system. You need to set up your decision-making so that everyone can enter into the process. Many organizations have two compensation systems: one designed to pay executives as much as possible, and the other designed to control employee cost. You should have only one compensation system. Everyone should be on it and it should be transparent. The approach in many organizations is that information is restricted. In Steve’s company, information is shared broadly. Everyone knows the salaries of everyone else. The more people know about the organization, the more trust there is going to be in it. The employees will raise more issues the managers might not have thought of. The management team invites staff members to join them during their meetings and discussions. The traditional approach to change is: an outside consulting group will take the executives to a retreat for a few days, and they will craft the strategic plans. The approach Steve uses: they will bring together 50 or 100 people representing their stakeholder groups in an interactive means of planning over a few days where everyone has a voice. The implementing is happening on the spot. Steve doesn’t think that their approach can work for leaders who are only concerned about their own advancement or prestige. It really only works when leaders are trying to serve others. There is a mindset that has to go underneath that. The mindset of having the purpose to serve other purposes, not just yourself.